Antoinette’s Salted Yolk Lava Croissant joins the game. Does anything not go with salted egg yolk? That’s the question that struck me when the third dish in a row, flavoured with the moreish sauce, appeared on my Instagram feed. Golden yellow, flowing and the right blend of salty-sweetness is the hallmark of a great salted egg yolk dish, it seems. 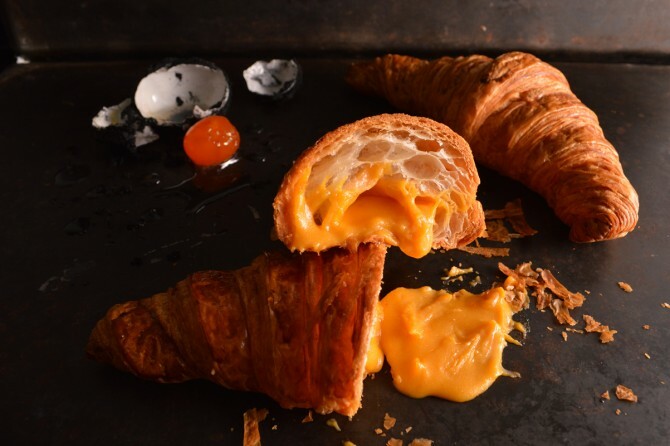 Come Feb 1, 11am, celebrated chef Pang Kok Keong of Antoinette will be launching his version of the salted yolk lava croissant ($6.50+) at the Penhas outlet. Be there or be hungry. Meanwhile, let us satiate your appetites with these other ways to enjoy the lip smacking salted egg yolk. Due to overwhelming orders, for today (1st March) our waffles are sold out 🙁 but we can still fulfill ice-cream cravings with our new flavours: Thai Milk Tea and Thai Green Tea! Salted Egg Shrimp bao at Bao Makers with @anothereverything 😍 yay to evenings winding down after work with the old friend, catching up over yummy food! No idea why reviews said the baos weren't filling. We were so full!